Many labour unions are either in the process of negotiating with their respective employers (mostly municipal, state, or federal governments) in Brazil, while others are actively on strike. These include federal workers from the government bureaucracy, school teachers, city staff, and university staff and faculty. In this piece, I would like to highlight how unions in the transportation sector are highly represented in these labour struggles. 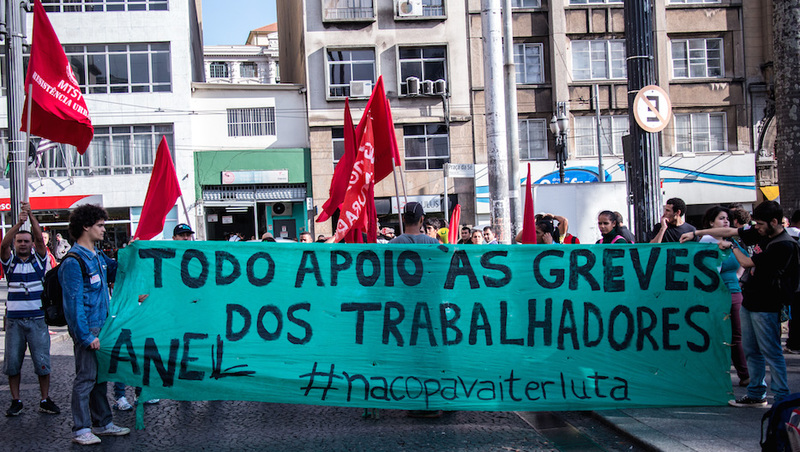 The Metro Workers Union of São Paulo is one of them and as of Monday, the 9th of June, it faces its fifth day of strike amidst layoff threats and a repressive state military police. Shortly before, the bus drivers of the city of São Paulo, represented by two unions, were also on strike. In both cases, the judiciary found the strikes to be ‘abusive’ and fined the unions hundreds of thousands of reais after ordering the workers back to their posts. The Metro Workers decided to continue the strike, with the support of a variety of social movements (including the Free Fare Movement – MPL, and the Homeless Workers’ Movement – MTST), political parties from the radical Left, and other labour unions. The judicial decision is being challenged for many reasons, but primarily for the fact that it is fuelled by illegalities committed on behalf of the employer that lead to the disavowal of the right to strike. A unified act in support of the metro workers was announced after the assembly for early Monday in the metro station Ana Rosa. The act was immediately interrupted by the arrival of the riot police squad. They advanced on the picketing metro workers, arresting some of them, and attempted to disperse the protesters who stood in solidarity with pepper spray, tear gas bombs, and raised weapons. Although some protesters attempted to kick the bombs back at the squad, the damage was done and even bystanders on their way to work were affected. A militant from the student movement and the PSTU was arrested, beaten, and humiliated by the police during an act of solidarity. 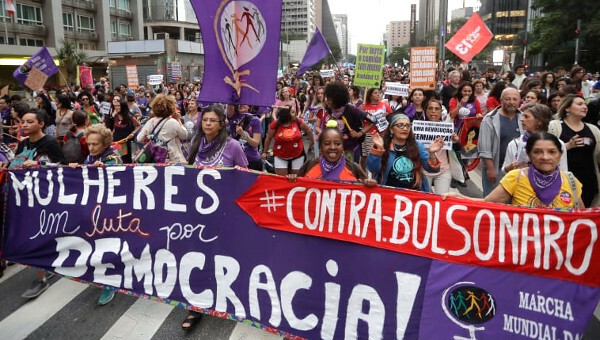 After recovering from the tear gas, the protesters assembled again at the metro station and, from there, they walked toward Praça da Sé in São Paulo, where they were joined by more social movements and political party representatives before marching again. 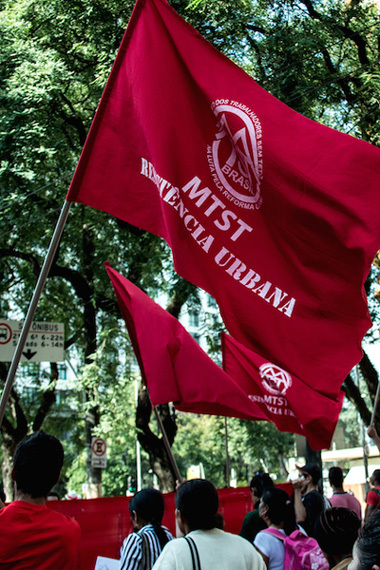 The MTST was heavily present, joining the others from its occupation in the east side of the city named “Cup of the Peoples” in response the crisis of living standards and access to housing exacerbated by the 2014 FIFA World Cup in host cities. The MTST struggle with the city and the federal government for the occupied lot resulted in a major victory on Monday night: the government committed to developing popular housing on the land and expanding the participation of organized social movements/institutions in the allocation of future housing by the government programme. Guilherme Boulos, from the MTST national coordination, happily announced that their current demands had been met and reiterated that the victory was a result of the strong mobilizations on the streets. The metro workers could not announce a similar victory late Monday night and decided to temporarily suspend the strike until a new assembly on Wednesday, June 11th, where they will vote on whether to resume the strike on the first day of the World Cup. At the time of writing, the strike will likely be resumed as the union fights to have the workers who were fired on Monday immediately reinstated. The role of labour is paramount to the solidarity on the streets at this moment, which differentiates it from the large street protests of June 2013. Political parties from the radical left have also been directly involved in this struggle, and militants from the parties PSOL, PSTU, and PCB are working with leftist collectives on the possibility of a general strike. Further, matters related to the right to the city are evident in the joint struggle by the MTST, labour unions, and other social movements fighting for social justice in the urban environment. 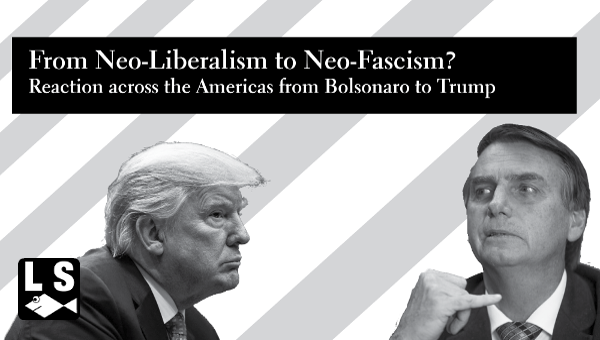 The urban social and geographical transformations caused by the World Cup have highlighted linkages between these struggles, as the process related to the mega event contributed to the history of dispossession and inequality in the big urban environments of Brazil. Metro workers: the people are with you. The crisis of the urban transportation sector is to be noted here, since the sector is known for its overcrowding and inefficiency. Public transportation is often privately run and it is a space shared by the working class (the poor and the lower middle-class) as well as students. The tax cuts for automobile purchases promoted by the Lula government a few years ago, and still maintained by the current Workers’ Party administration, have led to more cars on the streets and added to already bad gridlocks in cities whose urban road networks lack the capacity to handle so many vehicles. At the same time, it further discouraged those who can afford to pay for transit to use transit, as the system is devalued and considered the realm of the working class, especially those workers who commute for hours everyday in crowded buses and trains. A year ago, protesters mobilized by the Free Fare Movement were being violently attacked by the military police in the struggle for affordable (and hopefully free) public transportation in Brazilian cities. This and other groups and movements that mobilized the population last year have joined the Metro Workers of São Paulo in a way that the labour struggle is understood together with access to public transportation in the city and the quality of this access for the users. 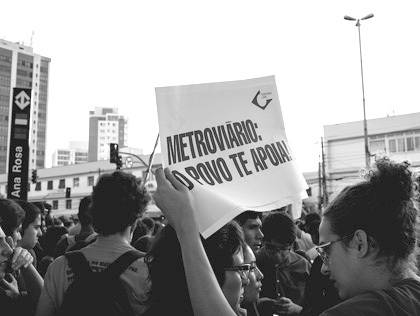 In fact, the Metro Workers Union challenged the governor of São Paulo directly in these terms: “instead of striking, we will work for free for a day if access is free.” Suffice to say that the proposal, understood as “catraca livre” (literally, a free turnstile), was not even entertained by the governor and the metro company. alternative is the end of the strike. Also worrisome is the fact that the metro company has enlisted untrained administrative personnel to run some of the trains in the meantime, putting the users at a great risk. City transportation workers in Rio de Janeiro and Natal, two other World Cup host cities, are also on the brink of a strike. In the Federal District, the bus drivers successfully negotiated a 20 per cent salary increase before the games begin, as Brasília, Brazil’s national capital, is also a key World Cup host city. The World Cup officially begins this Thursday and is considered a site of struggle for the Brazilian Left, both the autonomous and the organized, as the mega event has helped to highlight the state of inequality and social injustice in many Brazilian cities. The negative legacy of the World Cup ranges from large sums of public money spent on the event and some of its lavish structures to urban property speculation, gentrification, forceful removals, unjust labour trends, and even deaths related to the stadium renovations. It also provides a new kind of leverage, as the Brazilian government works to build up the spirits of the population with patriotism and the love for soccer. Such patriotism attempts to downplay the questions generated by the articulations of “There won’t be a World Cup,” “World Cup for whom?” and “At the World Cup, there will be struggle” that permeate the chants and demands of the groups mobilizing around the World Cup issue. The Brazilian government will be under international scrutiny for a month, and there is pressure for the host cities (and their respective airports) to run as smoothly as possible in face of the construction delays, budget scandals, and the growing antagonism toward FIFA that surround the games. The articulation “There won’t be a World Cup” (Não vai ter copa) was especially popular earlier in the year, and it targeted the World Cup spending and abuses. While the concept was powerful at first, it soon became evident that the World Cup was quickly approaching and it would happen – to the point that even president Dilma Rousseff boasted that “there will be a World Cup” on social media. The concept was then rearranged around the idea that the World Cup that will happen would not be the one the state and FIFA wanted, since the discontent would eclipse the festivities and the attempt to conceal the social problems in Brazil. It is true that enthusiasm around the event and supporting Brazil’s national soccer team seems subdued and World Cup decorations are not as widespread as before; however, a portion of the population is still looking forward to the event and will be present at the stadiums – primarily those who can afford to do so. Another popular articulation is the question “World Cup for whom?” and it is central to the work of the Popular Committees of the World Cup, which focus on exposing the negative impacts of the games and mobilizing opposition against the way the government and FIFA have managed them. The question is interesting, as it helps to unveil the structures that make such a profitable event possible, especially as the government’s argument that this World Cup is for the Brazilian people has fallen apart and cannot be justified based on the love for the national sport. The answer, the committees show, is a World Cup for big capital, large construction companies, property owners, and the elites who can access the games and get perks that middle-class attendees cannot afford. It is primarily a World Cup for FIFA, a private institution whose World Cup dealings have been slowly exposed. Mega events are normally promoted as a big tourism opportunity for the host country, and they are said to leave a legacy of improved infrastructure and national image. In the Brazilian case (and no doubt, to some extent, everywhere else where such events are held), the legacy is broken promises of improvement, capital and property speculation, dispossession, and the promotion of a constructed image of Brazilian culture that highlights the exotic and the stereotypical while it actively erases the social processes that make up the daily lives of Brazilians. Let us take the example of the favelas. Their alleged pacification, that is, the takeover of the favelas by the Pacifying Police Units (UPPs) in an effort to drive drug dealers away and make them safer, is a myth. The UPPs are known by favela inhabitants as repressive, racist, and violent. 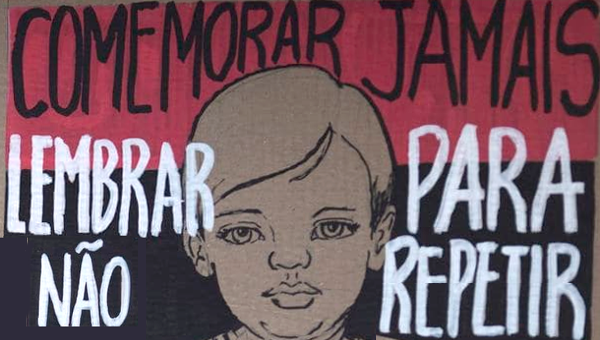 The disappearance of a man called Amarildo last year at a Rio de Janeiro favela after being taken for questioning by the police led to anger and protests. Amarildo has been joined by numerous others, such as Douglas (known as DG), and Cláudia. The three were parents and hard workers, and their murders are linked to criminal activities by the military police of Rio de Janeiro. Despite these stories and many others, the favela pacification is part of an effort by the city to promote them as lively communities where samba, carnaval, soccer, and feijoada thrive. The favelas are transformed into an exotic object in the unequal space of the city, one that can be exploited by tourism and conceals social injustice through a racist and commodified idea of cultural diversity. This is why the notion of “At the World Cup, there will be struggle” (Na copa vai ter luta) is so important. Promoted mainly by organized actors, such as radical left parties and central unions, it is not meant to say struggle was absent before and will be present during the event. Actually, it provides the social struggles in the city with a useful frame of contestation of capital and the neoliberal actions of the state. It is also a tool for politicization, as it demonstrates that popular discontent during the games is not limited to the oppression related to the FIFA interests, but to a larger system that permits such events to take on such a scale of exploitation for profit. 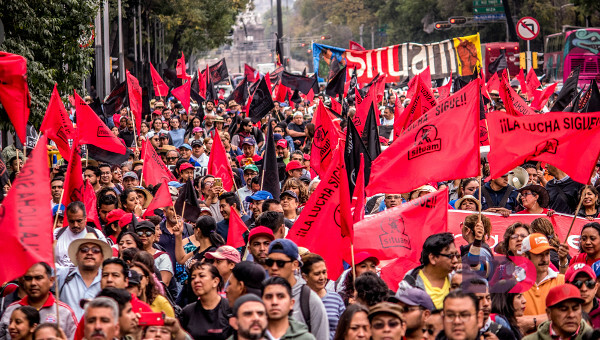 Thus, it brings to the forefront the idea of a more permanent struggle that is energized by the dialogue and solidarity that arise when many groups, social movements, and parties join forces to expose, denounce, oppose, and resist together. Ultimately, these joint struggles should aim to continue the work of mobilizing their membership base, which is fundamental to promoting class consciousness, as well as to politicize others into the struggle of building alternatives and a political project. All support for the workers’ strike. #attheworldcup there will be struggle. Sabrina Fernandes is an activist in the Brazilian radical left, a critical pedagogue, and Ph.D. Candidate in Sociology at Carleton University. She blogs at teseonze.com.br and tweets at @safbf.